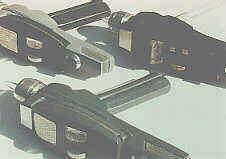 The classic Star Trek phaser came in a variety of colors and flavors. Four of these models stand out for our study. We have examined the first model, the black and white in the Dec/Jan article and we will now look at the second and third model of phasers. The classic Star Trek was a work in progress and went through many changes as it ran. For me, these changes are some of the endearing things about the early show. I ended up watching the classic episodes again and again to check out how it grew right before my very eyes. Most of the weapons and equipment went thought this kind of change and growth. For this second article we will start with the weapon seen, the black/very dark gray handle phaser one, with blue/gray pistol body. A little time line detailing is needed here. The black and white phaser did show up for the first eight episodes then disappeared forever. From the very first look, of the black and white pistol phaser all the eye sees is a nondescript gun-like thing. There is the white handle, the black upper body and the silver barrel with the clear tip. It did not look very good on the show and was a little "out-of-place" for there was so much color everywhere else, bright color, gold shirts, blue shirts, red guard rails, etc. 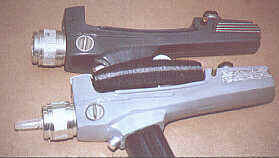 Which is why I believe they disappeared only after eight shows to be replaced with two more "colorful" paint schemas... A true black handle with matching black Phaser one in a bright blue main pistol body for the long shots and subdued very dark gray handle with matching phaser one with a medium blue-gray main pistol body for the inserts or close-ups.